Preheat the oven to 425�. In a bowl, combine the lentil and all-purpose flours with the semolina, curry powder, salt, and pepper. Add the water and mix until a smooth dough forms.... Wash the Chana Daal in a sieve under running water until the water runs clear. Put into a deep bowl. Now add enough water to the daal so it is just covered. Instructions. Place the lentils and broth or water into a medium saucepan over high heat. Bring the liquid to a boil. Lower heat and simmer, uncovered, until the lentils are tender but not mushy, about 30 minutes.... I make a bean soup where I add Eckrich skinless kielbasi. To me, it is so much easier than using a ham bone. I love the addition of ginger root too. So now, I must go find a piece of real silver to keep nearby in the kitchen. I love that tip too. If there�s one thing Trader Joe�s is good at, it�s making me do a double take. 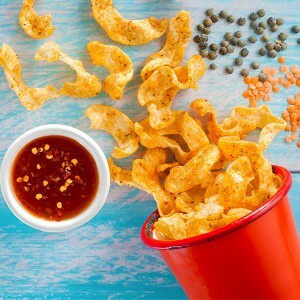 Case in point, Trader Joe�s Crunchy Curls, a bag of puffed up, curly snack thing that blends seamlessly into the endless wall of junk food until you notice it the bag tacks on �A Tasty Lentil & Potato Snack!�... 1 Preheat the oven to to 200�C, fan 180�C, gas mark 6. 2 Heat 1 tablespoon of the olive oil in a deep frying pan. Add the onion and the coriander, reserving a little to garnish. Lentil Curls Pellet � target mean length 36mm This product has a very rustic appearance but maintaining the light, crunchy texture and distinct lentil flavour. In a large bowl soak 2 and 1/2 cups of rice and 1 and 1/2 cups of "toor" dal, sometimes known as pigeon peas, in enough water to cover. Soak the rice and dal for 2 to 3 hours. 18/04/2013�� Make sure that you choose slightly tougher vegetables, though, rather than soft vegetables like peas, onions, or bell peppers, since soft vegetables tend to cook too fast. Make sure that you add more water if cooking the lentils with vegetables. Slow Cooker Curried Lentil Soup. An EASY flavorful lentil soup recipe seasoned with turmeric, ginger, cardamom, cloves, cinnamon, and coconut milk. An EASY flavorful lentil soup recipe seasoned with turmeric, ginger, cardamom, cloves, cinnamon, and coconut milk.